To Beard or not to Beard? That’s a good Question! The month of November is full of fun, interesting, and thought-provoking observances. November is National Raisin Bread Month, Historic Bridge Awareness Month, and Inspirational Role Models Month among so much more. November is also the host month to campaigns like No-Shave November and Movember. Campaigns such as these are working hard to raise money for important causes such as cancer research, education, and awareness. These increasingly popular campaigns are a great way to demonstrate your support … unless you need to wear a tight-fitting respirator for your job. So, you want to grow out your beard, but wear a tight-fitting respirator at work? Ensuring the respirator seal is a vital part of respiratory protection practices. Facial hair that lies along the sealing area of a respirator, such as beards, sideburns, or some mustaches, will interfere with respirators that rely on a tight facepiece seal to achieve maximum protection. Facial hair is a common reason that someone cannot be fit tested. The reason for this is simple – gases, vapors, and particles in the air will take the path of least resistance and bypass the part of the respirator that captures or filters hazards out. So then, why can’t facial hair act as a crude filter to capture particles that pass between the respirator sealing area and the skin? While human hair appears to be very thin to the naked eye, hair is much larger in size than the particles inhaled. Facial hair is just not dense enough and the individual hairs are too large to capture particles like an air filter does; nor will a beard trap gases and vapors like the carbon bed in a respirator cartridge. Therefore, the vast majority of particles, gases, and vapors follow the air stream right through the facial hair and into respiratory tract of the wearer. In fact, some studies have shown that even a day or two of stubble can begin to reduce protection. Research tells us that the presence of facial hair under the sealing surface causes 20 to 1000 times more leakage compared to clean-shaven individuals. So then, how are you going to participate? Luckily, the rules of No Shave November state, “Strict dress-code at work? Don’t worry about it! We encourage participation of any kind; grooming and trimming are perfectly acceptable.” And Movember is all about the mustaches. Ok. Now we can have some fun. Instead of gunning for the title of “most hairy”, how about being the “most creative” this November? Halloween is over. So put away those werewolf, Forrest Gump, and Rubeus Hagrid costumes. Instead, if you are going to participate in one of these facial-hair frenzied campaigns, channel your inner Frank Zappa, Rhett Butler, or Zorro. When’s the last time you rocked a good soul patch? (The official NIOSH recommendation is to listen to some classic jazz while trimming this particular style.) Not sure what kinds of facial hairstyles will work with a tight-sealing respirator? We’ve provided a chart below with our best guesses, complete with a line representing a typical sealing surface. A second option is to consult with your Respiratory Protection Program Manager about respirator selection options. In some work environments, a loose-fitting respirator, such as a powered air-purifying respirator (PAPR), is an option. 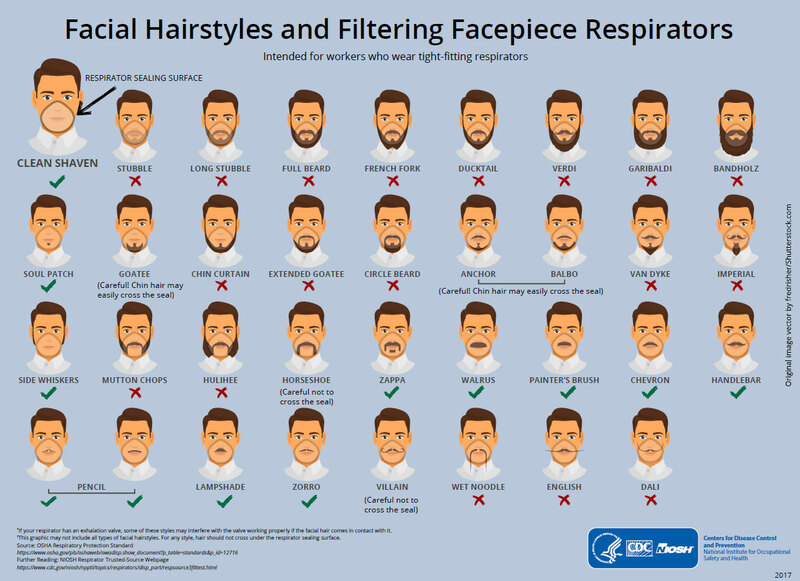 As we mentioned in another recent NIOSH Science Blog, Understanding respiratory protection options in Healthcare: The Overlooked Elastomeric, loose-fitting PAPRs may be used when fit testing fails or when facial hair is present. However, this may not be a feasible option for all beard-eager professionals out there. Finally, we must stress the importance of the user seal check. The user seal check can be either a positive pressure or negative pressure check. During a positive pressure user seal check, the respirator user exhales gently while blocking the paths for exhaled breath to exit the facepiece. If the check is successful, the facepiece will be slightly pressurized before increased pressure causes outward leakage. During a negative pressure user seal check, the respirator user inhales sharply while blocking the paths for inhaled breath to enter the facepiece. If this version of the check is successful, the facepiece will collapse slightly under the negative pressure that is created with this procedure. A user seal check is sometimes referred to as a fit check. Once a fit test has been done to determine the best model and size of respirator for a particular user, a user seal check should be done by the user every time the respirator is to be worn to ensure an adequate seal is achieved, regardless of your facial hair status. Check out the OSHA/NIOSH video on donning/doffing and how to conduct a proper user seal check. For anyone participating in one of these campaigns, we wish you best of luck with your creative facial hair endeavors! Jaclyn Krah Cichowicz, MA, is a Health Communications Specialist in the in the NIOSH National Personal Protective Technology Laboratory. Ronald Shaffer, PhD, is the Research Branch Chief at NIOSH’s National Personal Protective Technology Laboratory. Markee Shamblin is a Health Communication intern in NIOSH’s National Personal Protective Technology Laboratory . Stobbe, T.J., daRoza, R.A. and Watkins, M.A., 1988. Facial hair and respirator fit: a review of the literature. The American Industrial Hygiene Association Journal, 49(4), pp.199-204. In the Brazil, we have a book (by deceased Dr Maurício Torlini), that wich brings great informations about this issues. PROGRAMA DE PROTEÇÃO RESPIRATÓRIA – Recomendação, seleção e uso de respiradores. Great resource to assist those that are in need of ensuring they remain protected! Thanks and please repost again ahead of Every Movember! Facial hair of our some packer is one of our concern here, at our flour packing section in Saudi Arabia, we can not impose of policy not to have a beard because it is their culture in Islam country like KSA. My question is, is there a protection for this beard to prevent fallen hair into the bag of flour? This is a great article and the graphic is very useful for showing the facial hair styles that are, are not, and may be acceptable. It is an constant battle with the popularity of facial hair and all the TV shows that feature highly talented guys with beards and goatees wearing tight-fitting respirators while they sand and paint cool cars and trucks. The public sees this and assumes it must be OK, or else how would they be allowed on TV? The problem is getting acute. More so, where highly toxic gases, like hydrogen sulphide, are involved. Therefore, those who are very conscious of their looks should rather think of quitting “hazardous” professions and enter some clerical or similar jobs. By doing so,, they will be helping their fellow workers, also. K. N. Krishna Prasad, Chartered engineer; OHS Consultant & Trainer, Mysuru, India. Why don’t you consider the alternatives to close fitting face masks rather than imposing restrictions on workers? PAPRs cost more and involve additional logistical challenges compared to disposable N95 filtering facepiece respirators. Some loose-fitting PAPR models provide less protection (APF = 25) than other types of respirators (e.g., full facepiece APR with APF = 50). Hello, I am an occupationnal Hygienist and I am in charge of the respiratory program for the maritime employer association in Montreal (MEA). Can I get a high resolution picture of your brilliant infographic : facial air style ? It will be perfect to show to my employee (mainly french speaking lognshoremen) what is acceptable and what is not ? Did you happen to find a version in French. I am looking for a bilingual French/English version and thought you may have had some success in this area. This was such a great read! Could I also get a high resolution copy of the facial hair styles? to a high resolution copy that can be printed and posted. We have updated the image with additional information (i.e. implications for respirators with exhalation valves) and have included the updated image in the blog above. I agree with Remi and Judith above, can you provide a hi-res picture of the infographic?? Great article. Am updating my H2S/CO Life or Death Course and this is perfect timing for my update. Thank you for your article and graphic. I am the safety officer at a chemical company that has recently implemented a ‘clean shaven other than small moustache’ policy. The storm that has erupted has not been easy to weather but I am thankful that upper management has agreed that it is a small price to pay to ensure our employee’s safety! Why do we see so many EMS teams such as fire fighters, EMT’s and HAZMAT teams members with beards that may be required at any moment to wear a respirator? How do facilities get around 1910.134 when considering these teams? I can’t see how the Anchor, Balbo or Goatee can “not” cross the seal, no matter how careful you try. It is easy in my field, real firefighters don’t have beards. I work in healthcare, and TB is the big concern for us. I have a couple of questions because I am not of the I’ll that N95 masks provide sufficient protection to us. Our facility abolished the use of PAPRs because they claimed that the external fan was a threat to the steril field. This is significantly less air than a Bair Hugger blowing warm air produces, and in some of our orthopedic cases they do in fact use contained suits to minimize the potential for infection, and they too have an external blower device. There was a great article published about 2 years ago in an infection control journal that found that the PAPRs are not a threat to sterility, and so I wonder why they haven’t come back as an alternative to the N95 for those of us who failed the fit test. I suspect it has everything to do with cost of PAPR upkeep. Secondly, when donning an N95 mask, you may have a sealed fit under static conditions, but the moment you wiggle your nose or speak to an attending physician the seal is disrupted and likely fails to protect the user. Can you provide any insight as to the responsibility of the employer to provide safe means for their employees to care for droplet precaution patients? I feel as though my employer isn’t providing appropriate protection and I’m expected to enter those ORs. Thank you for your question. Because your question mentions sterile fields, we assume that it relates specifically to work in settings such as operating rooms, which are different from general patient rooms. There is certainly potential for exposure to infectious small-particle aerosols in operating rooms. Aerosol-generating procedures include intubation, open suctioning, use of power tools such as drills and saws, etc. A comprehensive approach is needed to protect against infectious disease transmission through the air by small particle aerosols in this setting. If possible, it is best to delay surgery on patients with contagious diseases potentially transmitted via small particle aerosols until they are no longer infectious. It is also important to have appropriate engineering controls in place, such as adequate ventilation. As you note, respiratory protection for those sharing the same airspace with such patients is also important. The appropriate respiratory protection in these settings provides protection against inhaling small airborne particles, such as infectious droplet nuclei. Generally, filtering facepiece respirators specifically approved for use in the surgical setting are the type of respirator used. You can find extensive information about them on NIOSH’s Respirator Trusted-Source Information website found at https://www.cdc.gov/niosh/npptl/topics/respirators/disp_part/respsource.html. You indicated that you were unable to pass the fit test conducted by your employer. If the specific model and size of N95 filtering facepiece respirator offered by your employer did not fit well enough to pass a fit test, other sizes and models should be tried. A list of surgical N95 respirators approved for use in surgical settings is maintained by NIOSH on this web page: https://www.cdc.gov/niosh/npptl/topics/respirators/disp_part/respsource3surgicaln95.html. Your employer’s occupational health staff and/or respiratory protection program manager should be able to work with you to find a respirator that fits, as required in OSHA’s regulations at 29 CFR 1910.134, which specify that the employer shall provide respirators which are applicable and suitable for the purpose intended. As you mention, powered air-purifying respirators (PAPRs) equipped with appropriate filters can also be used to protect against small particle aerosols. In addition, loose-fitting PAPRs have the advantage of not requiring fit testing. We are not sure which scientific article you are referring to in your question, however, current recommendations from OSHA do not allow for the use of PAPRs when a sterile field is required. As noted on page 25 of the Hospital Respiratory Protection Program Toolkit found on the OSHA website, there are concerns about the risk for contamination of sterile fields by air exhausted from PAPRs https://www.osha.gov/Publications/OSHA3767.pdf. However, as described in that document, PAPRs can be used in other healthcare settings where maintaining sterile fields is not a concern and are an option for use in those settings if for some reason you can’t identify an N95 filtering facepiece respirator that fits. thats a funny and important topic To Beard or not to Beard, I like the article and I think it is benefcial with all the information provided and all comments is great , thanks to the author for sharing with my best regards.